This is a beautiful, glittering and pure white tabby “flower” from Malacasheta, Minas Gerais, Brazil weighing 1.3 oz and measuring and 3.2” by 1.2” by 0.7”. She is doubly-terminated and she appears both shard-like as well as elestial-like. She appears to have been “dipped” into small crystals leaving only her lower termination clear with some neat little dendrites. 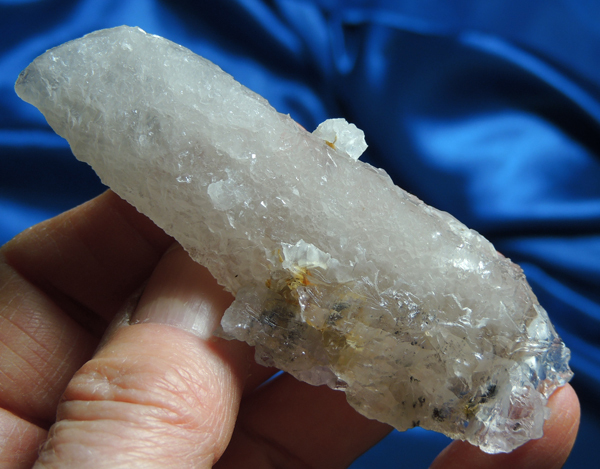 Larger crystals are at her sides along with just a bit of calcite in the crevices. You will want to explore her with a loupe as the tiny terminations have beautiful glyphs. As you examine her with a loupe, I guarantee it will be love at first sight! The island of Lemuria was lush and fertile and many beautiful and exotic flowers grew there, many unknown to us today, lost to the same seas that claimed Lemuria. But of all the flowers that grew there, this quartz was the most beautiful. These flowers would not die and their beauty never diminished so they were used as a gift of eternal love between spouses, siblings, parent and child and true friends as an expression of a special love that would extend beyond time and space and forever bond them. Athena quartz, named for the Greek goddess, Athena, who was supposed to have carried an owl on her shoulders when she talked to people so that both the spoken and unspoken could be heard, thereby seeing both sides to the truth. Thus the black tourmaline adds the element of truth in the love and the green tourmaline adds the sealing of that truth within the heart. Like the Lemurian quartz, these flowers were seeded across the Earth when the Elders knew that Lemuria would disappear. They were part of the heritage seeded for the world to discover when the time was right. And once you acquire one of these flowers, you will notice not just their beauty, but the amazing gentle and loving energies that emanate from them. Like rose quartz, the foster self-love but not the self-centered, egotistical kind, but the compassionate, sharing, caring, giving, empathic kind. This crystal is love you give your Self or especially, one you love! She opens hearts and allows unconditional, eternal love!